We pray to You, Lord, in the great expectation of receiving from You, O Divine King, mercy, peace, justice and all good things. One may gain a plenary indulgence by the public recitation of the Act of Consecration of the Human Race to the Sacred Heart of Jesus, and we exhort all faithful Catholics to offer, or renew, their consecration to the Sacred Heart of our Sovereign Lord. Encyclical of Pope Pius XI, December 11, 1925 On the Feast of Christ the King, this Act of Consecration is to be read solemnly with the Litany of the Sacred Heart before the blessed Sacrament exposed. Most sweet Jesus, Redeemer of the human race, look down upon us humbly prostrate before Thy altar. We are Thine, and Thine we wish to be; but, to be more surely united with Thee, behold each one of us freely consecrates himself today to Thy Most Sacred Heart. Many indeed have never known Thee; many too, despising Thy precepts, have rejected Thee. Have mercy on them all, most merciful Jesus, and draw them to Thy Sacred Heart. Be Thou King, O Lord, not only of the faithful who have never forsaken Thee, but also of the prodigal children who have abandoned Thee; grant that they may quickly return to their Father’s house lest they die of wretchedness and hunger. Be Thou King of those who are deceived by erroneous opinions, or whom discord keeps aloof; call them back to the harbour of truth and unity of faith, so that soon there may be but one flock and one Shepherd. Be Thou King of all those who are still involved in the darkness of idolatry or of Islamism; refuse not to draw them all into the light and kingdom of God. Turn Thine eyes of mercy toward the children of that race, once Thy chosen people: of old they called down upon themselves the Blood of the Saviour; may it now descend upon them a laver of redemption and of life. Grant, O Lord, to Thy Church assurance of freedom and immunity from harm; give peace and order to all nations, and make the earth resound from pole to pole with one cry: Praise to the Divine Heart that wrought our salvation; to It be glory and Honour forever. Amen. Lord, have mercy on us, Lord, have mercy on us. Christ, have mercy on us, Christ, have mercy on us. God, our Heavenly Father, Who has made firm for all ages your Son's Throne, Have mercy on us. God the Son, Jesus, our Victim-High Priest, True Prophet, and Sovereign King, Have mercy on us. God the Holy Spirit, poured out upon us with abundant newness, Have mercy on us. Holy Trinity, Three Persons yet One God in the Beauty of Your Eternal Unity, Have mercy on us. O Jesus, our Eternal King, Reign in our hearts. O Jesus, Most Merciful King, Reign in our hearts. O Jesus, extending to us the Golden Scepter of Your Mercy, Reign in our hearts. O Jesus, in Whose Great Mercy we have been given the Sacrament of Confession, Reign in our hearts. O Jesus, Loving King Who offers us Your Healing Grace, Reign in our hearts. O Jesus, our Eucharistic King, Reign in our hearts. O Jesus, the King foretold by the prophets, Reign in our hearts. O Jesus, King of Heaven and earth, Reign in our hearts. 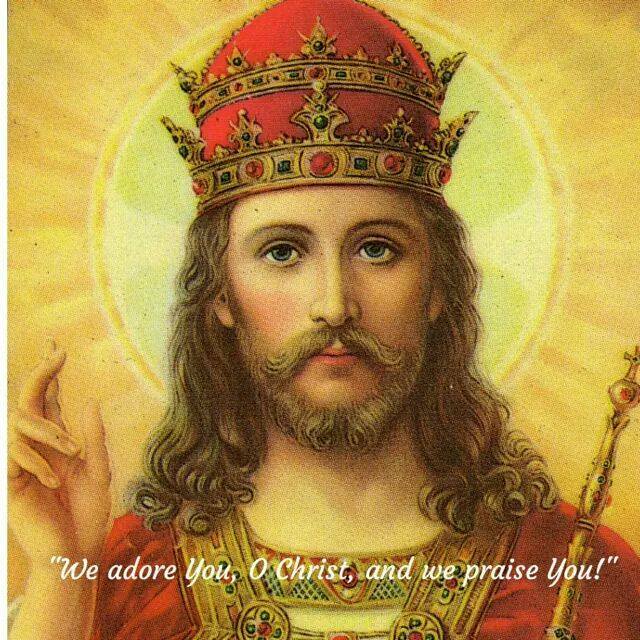 O Jesus, King and Ruler of All Nations, Reign in our hearts. O Jesus, Delight of the Heavenly Court, Reign in our hearts. O Jesus, King Most Compassionate toward Your subjects, Reign in our hearts. O Jesus, King from Whom proceeds all authority, Reign in our hearts. O Jesus, in whom, with the Father and the Holy Spirit, we are One,Reign in our hearts. O Jesus, King Whose Kingdom is not of this world, Reign in our hearts. O Jesus, King Whose Sacred Heart burns with Love for all mankind,Reign in our hearts. O Jesus, King Who is the Beginning and the End, the Alpha and the Omega, Reign in our hearts. O Jesus, King Who has given us Mary, the Queen, to be our dear Mother, Reign in our hearts. O Jesus, King Who will come upon the clouds of Heaven with Power and Great Glory, Reign in our hearts. O Jesus, King Whose Throne we are to approach with confidence,Reign in our hearts. O Jesus, King truly present in the Most Blessed Sacrament, Reign in our hearts. O Jesus, King Who made Mary the Mediatrix of All Graces, Reign in our hearts. O Jesus, King Who made Mary Co-Redemptrix, Your partner in the Plan of Salvation, Reign in our hearts. O Jesus, King Who desires to heal us of all division and disunity, Reign in our hearts. O Jesus, King wounded by mankind's indifference, Reign in our hearts. O Jesus, King Who gives the balm of Your Love with which to console Your Wounded Heart, Reign in our hearts. O Jesus, King Who is the Great I AM within us, our Wellspring of Pure Delight, Reign in our hearts. Jesus, King of All Nations, True Sovereign of all earthly powers, May we serve You. Jesus, King of All Nations, subjecting under Your feet forever the powers of hell , May we serve You. Jesus, King of All Nations, the Light beyond all light, enlightening us in the darkness that surrounds us, May we serve You. Jesus, King of All Nations, Whose Mercy is so Great as to mitigate the punishments our sins deserve, May we serve You. Jesus, King of All Nations, recognized by the Magi as the True King,May we serve You. Jesus, King of All Nations, the Only Remedy for a world so ill, May we serve You. Jesus, King of All Nations, Who blesses with Peace those souls and nations that acknowledge You as True King, May we serve You. Jesus, King of All Nations, Who Mercifully sends us your Holy Angels to protect us, May we serve You. Jesus, King of All Nations, Whose Chief Prince is Saint Michael the Archangel, May we serve You. Jesus, King of All Nations, Who teaches us that to reign is to serve, May we serve You. Jesus, King of All Nations, Just Judge Who will separate the wicked from the good, May we serve You. Jesus, King of All Nations, before Whom every knee shall bend, May we serve You. Jesus, King of All Nations, Whose Dominion is an everlasting Dominion,May we serve You. Jesus, King of All Nations, Lamb who will Shepherd us, May we serve You. Jesus, King of All Nations, Whose Reign is without end, May we serve You. Jesus, King of All Nations, Whose kindness toward us is steadfast, and whose fidelity endures forever, May we serve You. Eternal Father, Who has given us Your Only Begotten Son, to be our Redeemer, One True Mediator, and Sovereign King, We praise and thank You.Loving Jesus, Sovereign King, Who humbled Yourself for Love of us and took the form of a servant, , We praise and thank You. Holy Spirit, Third Person of the Trinity, Love of the Father and the Son, Who sanctifies us and gives us Life, We praise and thank You. Mary, our Queen and Mother, who mediates to Jesus on our behalf,Pray for us. Mary, our Queen and Mother, through whom all Grace come to us, Pray for us. Mary, our Queen and Mother, Singular Jewel of the Holy Trinity, We love You. Holy Angels and Saints of our Divine King, Pray for us and Protect us.